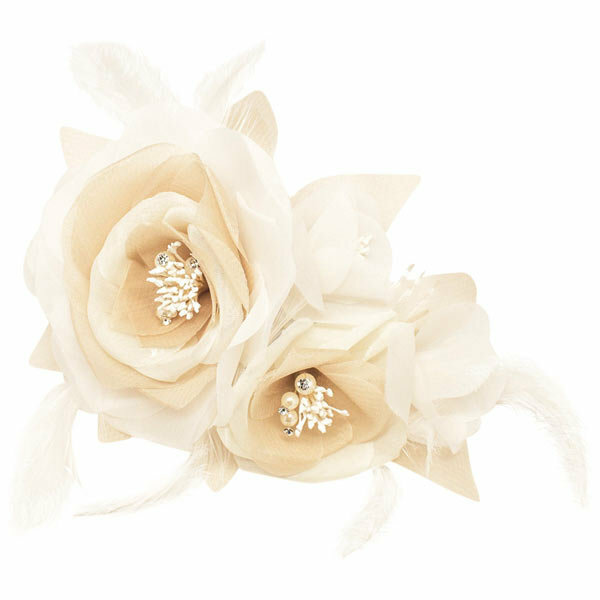 Organza hairclip by Hair Comes the Bride, $58. Jane Tran pearl hair-pin, $58. Crystal rose studs by Suz Somersall, $78. Ribbon earrings by Max & Chloe, $40. Crystal Necklace by T+J Designs, $78. Multi-strand pearl necklace by Humble Chic, $54. ￼Gold-plated bangle by Swarovski, $69. Gold sandal by ShopPriceless.com, $23. ￼Studded satin clutch by Nina Bridal, $89. ￼Bow leather clutch by Betsey Johnson, $68. ￼One-shoulder dress by Gown & Gather, $99.